Twice the overall power and three times the life of conventional automotive batteries. Up to 400 cycles at 80% depth of discharge! Remember when all a battery had to do was start the car? Whether for everyday or emergency use, today’s vehicles are loaded with more electronics than would have been imaginable just a few years ago. And today’s hobbyist vehicles now include more specialties and specialized power demands than ever before. Fortunately, the ODYSSEY™ battery has been designed to keep up with the changes. Because its plates are made of pure virgin lead (unlike the lead alloy in most batteries), we can pack in more plates. And more plates mean more plate surface area, and much more power — twice the overall power and three times the life of conventional batteries — up to 400 cycles at 80% depth of discharge! Bottom line? The ODYSSEY battery delivers the massive starting power, rapid recovery, and amazing deep cycling capability that today’s vehicles demand. The electronics in today’s vehicles require heavy power. 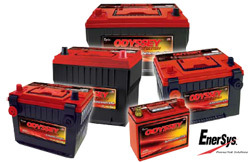 The ODYSSEY™ battery delivers it while providing reliable starting for up to 3X as long as conventional batteries. Classic and restored cars are often kept in storage for months. With the ODYSSEY battery, they’ll start reliably for up to two years (when stored at 25ºC (77ºF) from a fully charged state). Featuring rugged construction and a nonspillable, dry cell design, ODYSSEY batteries ensure extreme shock and vibration resistance for the toughest off-road applications. High-compression, massive horsepower engines demand massive starting power. The superior cranking ODYSSEY battery provides it for much longer than conventional batteries. From low-riding hydraulics to high-intensity discharge lights, the non-spillable Odysey battery can power any modification, and can be mounted in almost any position. Limited 3- and 4-year full replacement warranty – not pro rata. With 3-10 years of service life, ODYSSEYTM batteries save consumers time, money, and aggravation. 70% longer cycle life compared to conventional deep cycle batteries – up to 400 cycles at 80% depth of discharge – high stable voltage for longer periods of time. Can be stored on open circuit (nothing connected to the terminals) without the need for recharging up to 2 years or down to 12.00V, whichever occurs first. The highest recharge efficiency of any sealed lead battery on the market – capable of 100% recharge in 4 - 6 hours. Non-spillable design – can be mounted on any side in any position except inverted. Design protects against high impact shock and mechanical vibration – a common cause of premature battery failure. Operating temperatures from -40°C (-40°F) to 80°C (176ºF).